Are you living in Southampton, Portsmouth or Hampshire and in need of a new balustrade, including spindles and banister? We have a huge range of stair parts, including wooden and metal spindles, available for purchase in our online store. 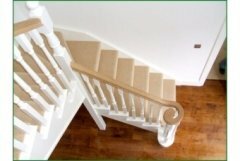 Pear Stairs is a company committed to providing superior staircases and stair parts to the people of Hampshire. Our services, products and support are next to none, and we know we are the best staircase company in Britain. 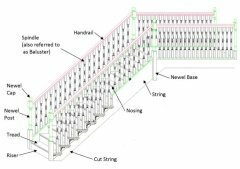 Not sure where to start with replacing stair parts? Don’t know a banister from a balustrade, a spindle from a baluster? Look no further, because we have all the answers and so much more. A baluster is actually the same as a spindle, and these plus the handrail (colloquially known as a banister) and a newel base, post and cap make up a balustrade. Still confused? See our Help and Resources page, which includes glossaries, diagrams and guides. Pear Stairs provides the full package when it comes to stairs; we design and manufacture whole bespoke staircases, as well as retailing the entire range of stair parts separately. So whether you want to complete your grand design in Southampton with a standout staircase, or invigorate a tired stairway in Portsmouth with a new banister, Pear Stairs has what you need. We’ll even clear up the spindle, baluster confusion. Pear Stairs' collection of metal and wooden spindles comes in various designs, and even combined wood and metal spindles are available. Why not embrace Portsmouth and Southampton’s maritime roots with our quirky ‘ID Flo’ baluster; designed to resemble waves? We are sure Pear Stairs has the parts the people of Hampshire are looking for. Choose a beautiful balustrade made up of the finest metal or wooden spindles. Pear Stairs deliver directly to Southampton, Portsmouth and Hampshire.